Wait! Don't throw that away. Here's 7 unique repurposing crafts that will give those old things a new reason to stick around. How many coffee makers have you gone through in your life? If you’re like me, (who drinks at least one cup every day) you've probably owned more cheap coffee makers than you wish to count. 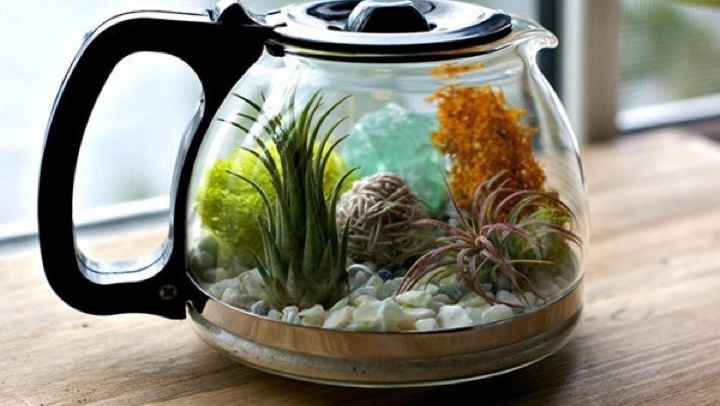 Here is a way to give those used coffee pots another life! Grab some decorative pebble or rocks, some air plants (also known as tillandsia), and some artificial plants (moss actually looks great). BOOM! You’ve got a cool living conversation piece that requires very little maintenance. Photo courtesy of realitypod.com. Hang file holders on the backs of doors, cupboards, and nooks to maximize your space. Plus, it's a super quick way to organize that junk drawer! Photo courtesy of goodhousekeeping.com. The beauty of this repurpose is that you can really put your signature look on it with very little money spent. Glass bottles are very easy to come by, and come in different shapes and sizes. Pop on over to Lowe’s where they sell lamp kits just for these types of projects. You'll be well on your way to creating something that now has another useful life! Beats sitting in a landfill, right? For more detailed information on this repurpose project, visit here. Photo courtesy of theinspiredroom.net. This is one of the more-functional repurposed items that I've seen in a while, and probably the easiest to create. Legos can be found anywhere (garage sales, thrift stores, etc. ), and this repurpose design helps you keep track of your keys (not in the crevice of your couch). To complete, just affix any large, flat Lego piece to a wall by your front door, then drill a hole in some 4x2 Legos (4 bumps long, by two wide). Simply attach the Legos to your keychain, and you’ve got yourself detachable key holders that just gave another life to a favorite toy. This repurpose project is small on budget, big on design impact. Wood stumps or decorative wood branches can be found all around your home. With a drill and some tea light candles, you're all set to get your craft on. For step by step directions on how to build these, click here. Photo courtesy of cozystylishchic.com. This repurpose project might be a little tougher to create, but it's worth the nostalgic feel! Talk about a conversation piece... Photo courtesy of houselogic.com. How many old wooden chairs have you seen at garage sales, thrift stores, or even your own storage closet? With a little help from a skill saw and maybe a stain or two, you can turn some old dining room chairs into some unique pet feeders that won’t get knocked around. Photo courtesy of boredpanda.com. Do you have a unique repurposing craft? We'd love to hear about it! Submit your feedback to tony@seqeq.com.